Long before the rise and fall of the Third Reich, long before the rise and fall of the House of Usher, long before even the rise and fall of the Roman Empire, history and literature both ignored the rise and fall of ancient Lonibabia, the nation that partied itself into oblivion. But deadly prophecy remains, and fulfillment seems horribly near at hand. Is this the Fall of Civilization? Or can the Ghostbusters gate-crash the world's last bash? * complete descriptions of the Elder Gods of Fast Times - the four Frog Riders of the ApoKERMIS! 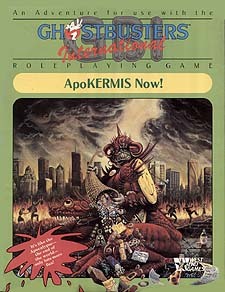 A complete Ghostbusters International adventure for Ghostmaster and two or more players. For ages 12 and up.